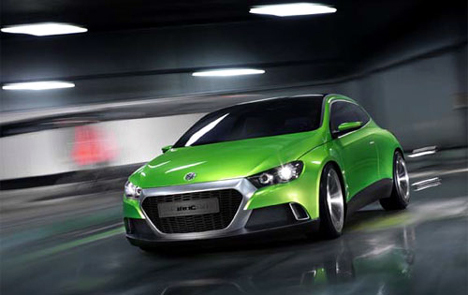 Volkswagen have released these pictures of their Iroc concept car, giving a strong indication of how the third generation of Scirocco might look. The Iroc (named using the four middle letter of Scirocco) is said to be going public for the first time this September at the Paris Motor Show. Based on a lightly modified version the Golf platform as well as a whole range of models from Volkswagen, Audi, Seat and Skoda, the Iroc sits on a set of striking 19 inch alloys. Power will come in the form of the supercharged and turbocharged direct-injection Twincharger 1.4L unit that powers the Golf GT, with some tweaking the Iroc should hit 60 mph in around 7 seconds and keep going until it reaches 150 mph. A 280 bhp 3.6L V6 is also under discussion. 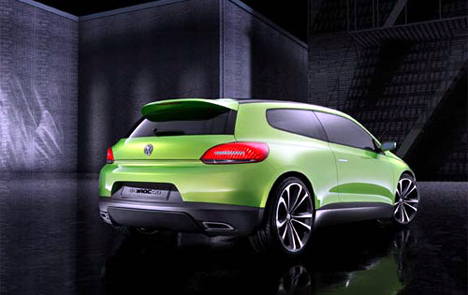 I hope the new Scirocco is a little less lairy. 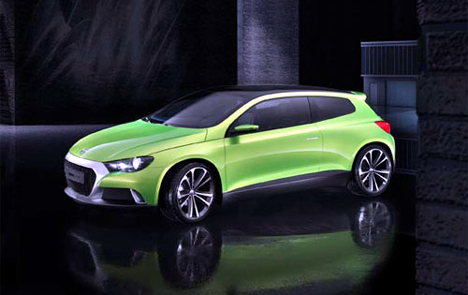 This looks like a radioactive Audi A3 that’s been butchered on ‘Pimp My Ride’. shame they didnt feel the need to show anything at the motor show this year…not enough room i guess…fox, polo, golf, golf+, touran, passat, passat estate, jetta, sharan, phatone, touareg….just how many models do they need?